During February 2003 on diamond geezer I kept myself busy by counting things. Ten different counts, to be precise, in a none-too thrilling daily feature called The Count. My 28-day tally chart may have been deathly dull to the rest of you, but I've continued to count those categories again, every single February since, purely to keep tabs on how my life is changing. Sixteen years later, I can confirm it's changed quite a lot, not least because I no longer have a job so get to spend my February how I like. Below are my counts for February 2019 (also available in graphical form via Daytum), accompanied by the previous statistics and some deep, meaningful pondering. Yes, I know February's not over yet, so all the figures below are based on best estimates for the final 24 hours. But don't worry, I'll come back and update the 2019 data as today plays out, before settling on the finalised figures at the end of the day. Count 1 (Blog visitors): It's been another good month for people turning up to read what I've written, and has fractionally overtopped last year's total, which was the busiest February ever. I'm averaging almost two and a half thousand visitors a day, which is as good as it's ever got, so I can't complain. 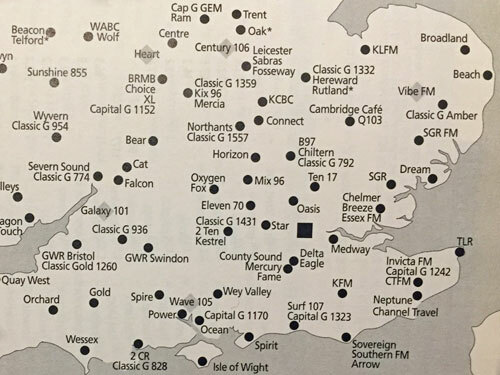 It amazes me sometimes that anyone comes back when there's the risk of reading about local radio in Bedford, suburban tumuli or a bus journey to Pinner, which is hardly "must read" subject material for the average person in the street. But I do try to provide you with a varied diet where possible, rather than endless recycled press releases, because I believe there is still demand out there for original subject matter. It's not all high octane stuff here, not by a long chalk, as a survey of station announcements and a trip to IKEA will have confirmed. But as one of my regular twenty-five hundred, I assume you either keep coming back for the variety, or can put up with the personally-irrelevant stuff inbetween. Count 2 (Blog comments): There's nothing quite so unpredictable as comments. Some days this blog attracts hardly any, while other days the discussion catches fire and you add dozens. This month we've been averaging about 25 a day, which may be noticeably down on last year's total but is still damned impressive. Most blogs either no longer allow feedback or have commenting zones resembling tumbleweed, but somehow you lot always seem to carry on talking, nipping in with a pertinent reference, a pedantic query, a nostalgic nod, some schoolboy grandstanding or a bit of insider know-how. Admittedly it doesn't take much to set a few of you off, particularly if the topic is transport-related, and some days the gradient between sparkling and tedious can be steep. But one amazing statistic is that 270 different people have commented this month, chipping in when they have something relevant to say, and that variety is truly humbling. Somehow a community has evolved here, where regular and occasional commenters co-exist, and that's not an easy thing to create. Thanks everyone, because it's you that helps to bring this page to life. Count 3 (Blog content): The number of words in my posts has been creeping up since I started blogging, and this is my wordiest February yet. But not by much. I seem to have settled down at a grand total of just over thirty thousand words, which is an average of about 1200 a day, which is not to be sniffed at. I wonder how many of you write that much on a regular basis? It's the equivalent of writing five novels a year, except I never end up with a book to show for it (so perhaps I'm doing this blogging lark all wrong). Count 4 (Sleep): Now that I don't have to go to work I sleep longer than I used to. That's perhaps no surprise. Previously my alarm was always set for six-thirty, and now I just wake up when I wake up, which tends to be nearer eight. Interestingly my going-to-bed time hasn't really changed, it's still well past midnight, usually because I'm finishing off the post you're going to read the following morning. But averaging seven hours sleep a night rather than six must be doing my body the world of good. Count 5 (Nights out): Thanks to a social resurgence at the very end of the month, I've managed to nudge this count slightly up on last year's total. Before you get the wrong idea, the majority of this February's trips have been no further than BestMate's sofa (where we watched Netflix-sourced video on his telly and put the world to rights) and the other was an evening out with my brother (including pizza). I have sort-of tried, but an average of once a week isn't great, is it? Must try harder. Count 6 (Alcohol intake): For the purposes of this long-term count, my definition of alcohol is a specific gassy bottle of German lager. I cling to Becks for familiarity and ease of ordering, plus it doesn't give me hiccups, but it's become increasingly hard to source on a night out. It wasn't on the menu in the one restaurant I went to, so I had to choose something else, but even so my Bottled Beer count this month is no higher than one. I probably should have opened that chilled bottle of Becks in the fridge. Count 7 (Tea intake): Apart from one dodgy year when workplace kettle usage was banned, my tea consumption remains impressively consistent. Every February other than 2005 has fallen within a narrow range of 120-140 teas, despite very different behaviour on weekdays and at weekends. My deskbound days were always brimming, brown-liquid-wise, whereas days out invariably find me rushing around without pausing for refreshment, and there have been a lot more of those recently. Nevertheless I remain, on average, a four-and-a-half cups a day man. Milk, no sugar, thanks. Count 8 (Trains used): This count's normally pretty consistent too... always just over a hundred a month (apart from the year when I had a "one train" commute rather than two, when the total dipped a bit). I don't have to travel by train any more, but I choose to do so to explore the capital, hence the number's increased a bit this year. If you're counting, I've also travelled on 47 buses this month, five trams and two ferries (and walked up forty-one escalators). Count 9 (Steps walked): Hasn't the weather been good this month... and I wonder if that's why my monthly steppage total is so high. I've smashed all previous records by a considerable distance, walking 120000 steps more than my previous high point last year. That's an average of 16500 steps a day, the equivalent of eight miles daily, which means I've walked over 200 miles altogether this month. Why sit in the house when there's a world outside to explore? That said I had hoped the extra exercise would help knock a couple of pounds off my waistline, but not a bit of it. Count 10 (Mystery count): Sorry to disappoint you all, again, but the legendary diamond geezer Mystery Count continues to be nil. I know, I'm as unimpressed about the outcome as you are. There was a February, before I started blogging, when the mystery count would have been in double figures, but February 2019 is no such month. Again. Apologies. London has a brand new A-road. It's the A4380, and you may know it better as Gloucester Place. This is the very southern end of the road to Birkenhead, the A41. 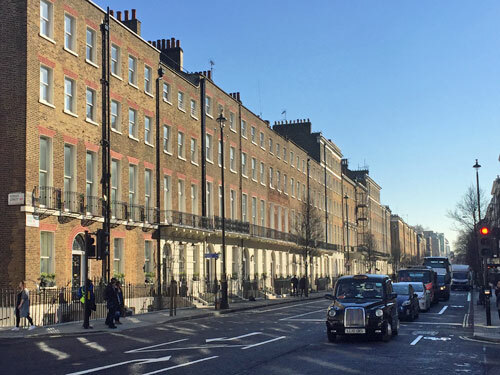 Both Gloucester Place and Baker Street previously enjoyed the A41 designation because both of them were one-way streets. But now they're two-way, so only one of them can take the A41 crown, and officially that's Baker Street. 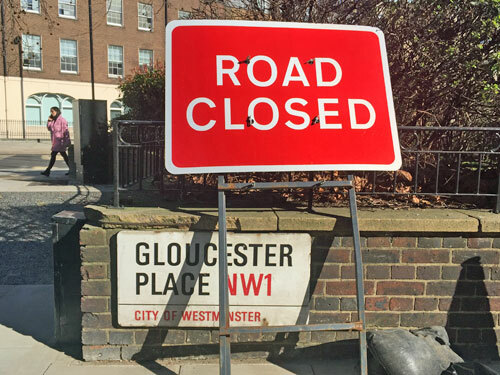 Meanwhile Gloucester Place has been designated the A4380 by the Department of Transport, unsurprisingly because "there are no two digit numbers available", making it the capital's newest A-road. I've been to check it out. Two-way roads aren't especially special, or inherently difficult to use. What's awkward is the switch from one- to two-, and how to re-engineer the available roadspace. Previously Gloucester Place had three lanes along most of its length, which probably encouraged some vehicles to drive faster than they should. Now it has one lane north and one lane south, plus cycle lanes to either side (unsegregated, and intermittently merged with bus stops). Baker Street is similar, making for less vehicle space overall but safer conditions for bikes. I'm not familiar with the precise busyness of these roads previously, plus Weekday One is never the best day to judge how a new road system has bedded in. What I can say is that Gloucester Place was much busier northbound than southbound and Baker Street much busier southbound than northbound, as many drivers continued to use them exactly as before. That'll change. I also watched a white van drive the wrong way up a switched sidestreet, ignoring the honks of a council lorry and diverting onto the pavement to pass traffic going in the correct direction. That'd better change. To keep an eye on initial behaviour, and to nudge those breaking the new rules, an army of traffic marshals has been despatched. Four staff in hi-vis were standing at every significant junction on both roads, one at each corner, marshalling pedestrians and assisting vehicles attempting to go the wrong way. That's a lot of contractors - I counted 88 in total - but important if years of engrained behaviour is to be unlearned and the switchover completed without major incident. At the top of Baker Street I watched a taxi drive nonchalantly into what had been a southbound lane only to be stopped and told it now very much wasn't. On Gloucester Place one marshal was being paid to scream "Please look both ways before crossing for your own safety" at approximately 30-second intervals. Another gestured urgently with his hand whenever another pedestrian ignored the lights and crossed anyway, then gave up when everyone surged across ten seconds early. My favourite overheard marshal conversation went like this: "What's da business here?" "2-way! 2-way! 2-way!" "Why?" "Dunno." One thing about switching from one-way to two-way traffic is that lights stay red for longer. Additional movements create additional conflicts, so several road junctions now have to include an all-stop pedestrian crossing phase. 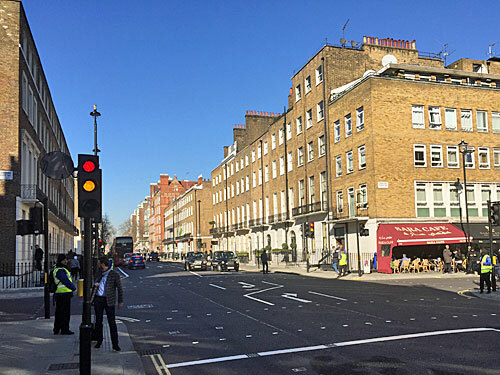 There are also a few junctions where certain turns are barred, most notably heading north on Baker Street where everything that isn't a bike, bus or taxi has to turn off before reaching the Marylebone Road. That makes the northbound section of Baker Street outside the tube station very quiet, and means car drivers can't actually head north on the A41 without diverting to the A4380 after all. Some of the biggest impacts have been on buses. 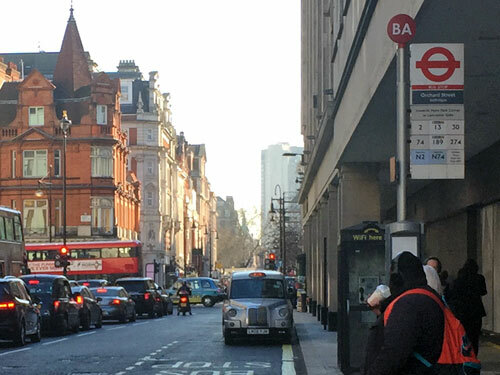 TfL could have left them all alone, keeping all northbound bus stops on Gloucester Place and all southbound bus stops on Baker Street, but have chosen not to do this. Instead they've made several switches, and summarised the changes in a none-too-helpful map posted up at every bus stop. It shows where to catch your bus at one of twenty-three local stops (including two Bus Stop Ls, two Bus Stop Rs and two Bus Stops Ws, so they've had to use two colours). It's a masterpiece of being quite useful for one task and completely opaque for all the others. I've decoded the underlying pattern, which took a while, and can confirm the following. All southbound buses use Baker Street and none follow Gloucester Place. Meanwhile three northbound daytime buses do follow Gloucester Place (2, 30 and 74) but all the others use Baker Street. The 2 and the 74 aren't particularly useful routes because they're just about to terminate, so the only true anomaly is the 30 which has to use Gloucester Place to be allowed a right turn onto Marylebone Road. In short, if you want the northbound 30 go to Gloucester Place and if you want any other bus route, north or south, go to Baker Street. Why are these things always dressed up so complicatedly? The realignment of local bus services means that several new bus stops are required, while other bus stops are being taken away. It may not surprise you to hear that this process has been carried out badly, and that bus passengers are far more likely to be confused than car drivers, pedestrians or cyclists. Several bus stops are showing incorrect route numbers on their tiles. Some are wrongly-lettered. Most of the new bus stops have no timetables. No bus stop is showing an up-to-date spider map, because none have been produced. The Bus Stop Goblins have simply stuck up their summary 23-blob maps and left it at that. 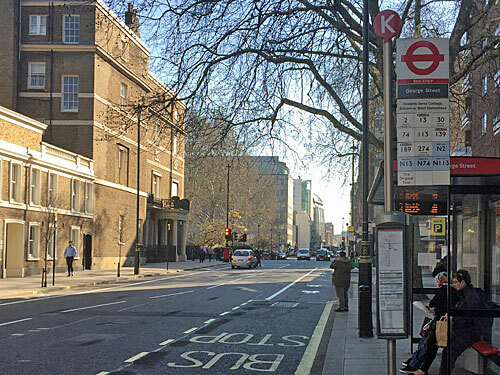 In Gloucester Place, Bus Stop K still displays the numbers of six bus routes that no longer stop here. One of these is the N13, a route which ceased to exist 22 months ago. Bus Stop R doesn't have an N13 tile but does include the other five routes that no longer serve Gloucester Place. Bus Stop S is no longer the penultimate stop on route 2, but the tiles still say it is. Bus Stops T and U are discontinued because no buses serve the top end of Gloucester Place any more, whereas last week five routes did. There are no southbound bus stops because there are no southbound buses. 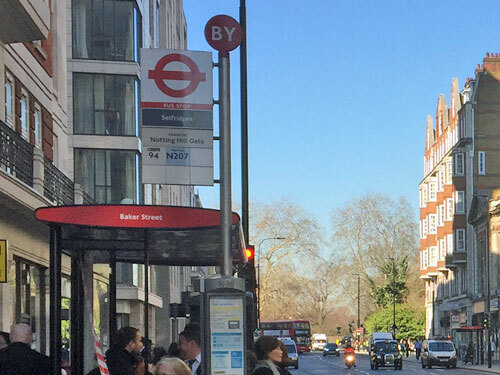 Baker Street has gained four new northbound bus stops because there are now northbound buses. Bus Stop BA displays the numbers of eight bus routes, five of which don't stop here, and omits two routes that do. There are no timetables. Bus Stop F doesn't have an F on top, so it's hard to match up with the list provided on the map. It also manages to display the numbers of two bus routes which don't stop here. Again there are no timetables. Baker Street northbound is particularly rubbish. But here's the worst one. This is Bus Stop C, the new bus stop opposite Baker Street station. Six bus routes stop here, none of which are displayed on the tiles. The two bus routes displayed - the 94 and N207 - do not stop here nor anywhere nearby. It seems the Bus Stop Goblins have nicked a former bus stop pole from Oxford Street, now surplus to requirements, and implanted it here without changing anything. That's why it says BY on top, not C, and that's also why it says Selfridges, not Baker Street, because that's where the stop used to be. Unsurprisingly the timetables are incorrect too. As a further demonstration of lack of foresight, the next northbound bus stop (on Park Road) was closed yesterday because of an overhanging tree. 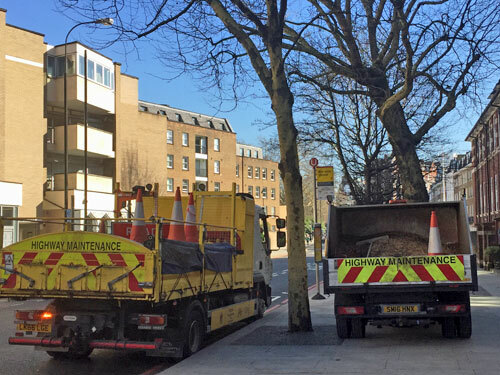 Nobody noticed how overhanging the tree was until Sunday, because that was the first day of two-way traffic, so buses have had to be diverted via Gloucester Place while contractors move in and make things safe. Also this particular bus stop ought to be labelled X, according to the map, but the red circle on the top says U because it's been recycled from round the corner in Gloucester Place. I took a ride up Baker Street on a northbound bus, and was surprised to see that the iBus system thought we were on diversion because nobody's entered the new routes into the database. Nobody's changed the routes over on the website either, so for example the northbound 13 is still shown going up Gloucester Place which it doesn't (apart from the short bit it did because of the overhanging tree). It also means all the datafeeds are wrong, so even Citymapper can't tell you what's stopping where and when. Repainting the road and reorganising the street furniture seems to have worked flawlessly, but attempting to relocate a few bus stops has proved an utter organisational shambles. London has a brand new A-road. Don't come by bus. Most visitors to Cambridge know The Backs, the serene punting channel to the rear of King's College. But few keep walking up the Cam, past greens, fens and commons, to escape the city. You have to know where you're going, across the Lammas Field, through the Paradise Nature Reserve and on down a footpath at the far end of a smart residential street. 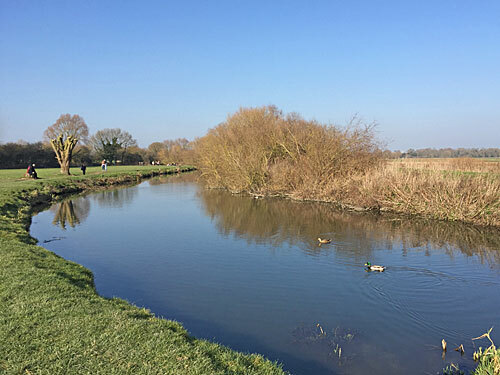 But Cambridge's residents and student community know, for this is their escape route to a default constitutional upriver: a mile or so through the meadows, some refreshment at the far end, then back again to exercise it off. Grantchester Meadows are long, thin and officially owned by King's College. One side is bounded by the meandering river and the other by a straighter, higher tarmac path, ideal for cycling. Those in less of a hurry follow the river, unless it's too muddy, which thankfully at the weekend it never quite was. The lower path is intermittently segregated by narrow footbridges across squelchy inlets, although never allowing passage to the opposite bank. It's ideal dogwalking or picnicking territory, in both cases especially when the meadow's seasonal herd of cattle aren't on the loose. Expect a highly educated level of overheard conversation en route. I wasn't expecting to find a Sikh family pouring a family member's ashes into the river, nor a lone canoeist trying his best to keep a reverent distance, but that's the eternal allure of the Cam. The village at the end of the 'Grantchester Grind' is small, scenic and ultimately medieval. It's also very famous, most recently because ITV based a series of murder mysteries here, which probably explains why I spotted a rotund man having his photo taken next to the village sign. You can see the televisual appeal - a nucleus of thatched (and unthatched) cottages, various bespoke detached properties, a riverside location, a well-hidden council estate and several pubs. No village of this size needs four pubs, let alone a walk-in gin distillery, but their taps and covers survive on a steady flow of incomers. Grantchester came to national prominence a century ago thanks to the poet Rupert Brooke, who lodged at The Old Vicarage for a short time while studying at the university. His 1912 poem compared life abroad in Germany with sylvan times in the village, with "a bosky wood, a slumbrous stream, and little kindly winds that creep round twilight corners, half asleep." 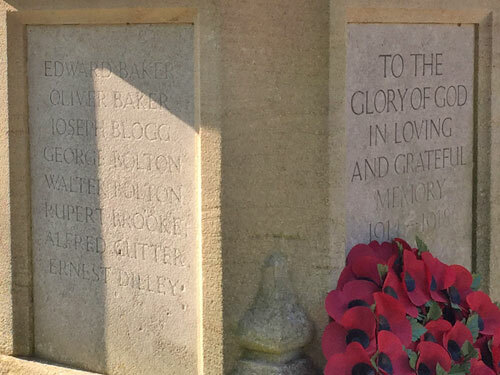 Rupert's reputation was made by writing about the war that claimed his life, less than one year in, and it's poignant to find his name inscribed on the war memorial outside St Mary and St Andrew's church. • "Stands the Church clock at ten to three?" Twice a day. • "And is there honey still for tea?" Yes, at the tearoom. The tearoom making the most of Brooke's reputation is a 19th century original based in an orchard, called The Orchard. You too can sit outdoors amid the fruit trees where Brooke and his fellow students took tea, or sit inside the original pavilion with a plate of cakes. You may also get to queue for absolutely ages at the servery door, which I suspect is most likely at the height of summer but it turns out unseasonably fine Februaries have the same effect. Whilst the overall rustic atmosphere was spot on, the twelve-point health and safety notices posted up beside all entrances read somewhat joylessly. The small adjacent Rupert Brooke museum has closed. 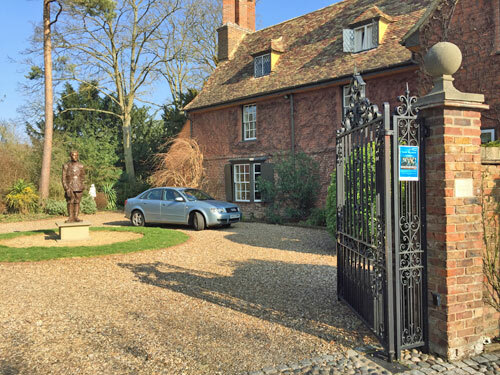 As for the Old Vicarage, for the last 40 years it's been owned by the famous author/politician/criminal Jeffrey Archer and his fragrant wife Mary. It's large but not enormous, secluded but not hidden, and surrounded by well-tended gardens liberally scattered with sculptures. I liked the flock of sheep amid his silver birches, was less enamoured by the statue of Rupert Brooke in his turning circle and wasn't convinced by the black horse on his private island. 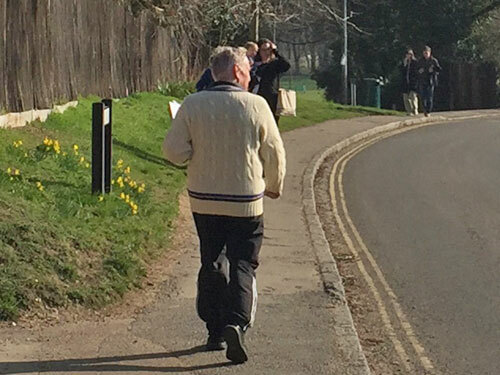 There's a twist in my tale, because five minutes up the road I saw a short paunchy grey-haired man wearing a white cricket jumper walking towards me. It turned out to be the very man himself, heading home to his weekend bolthole with a folder in hand. I suspect he'd been to the pub for lunch, because he can't have been returning from the village shop because there isn't one, and he was smiling. It's a good life in Grantchester, beyond reasonable doubt. Brooke isn't the only Cambridge-educated poet to be commemorated around here. 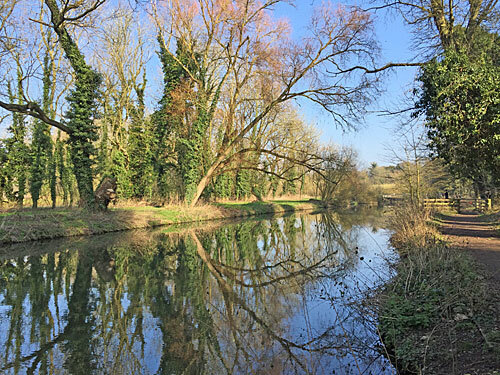 Lord Byron was known to pop down to a shady spot above Grantchester to bathe in the Cam, a site now named in his honour, and a local nature reserve to boot. It's still a lovely slice of riverside, a long tongue of sycamore facing a wall of reedy branches in the first itch of spring. Ironically the least attractive part of the reserve is Byron's Pool itself, into which has been slotted a modern sluice and weir, so best walk past that fast and return to the splendour of the watery woodland. 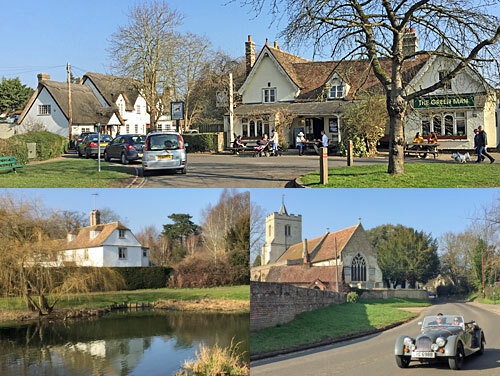 Grantchester's neighbouring village hasn't been quite so successful at holding its identity, first touched and now enveloped by Cambridge's suburban sprawl. A central triangle with church and cottages survives, as does a privately owned stately home, but elsewhere are housing estates of various vintages, many of them particularly recent. 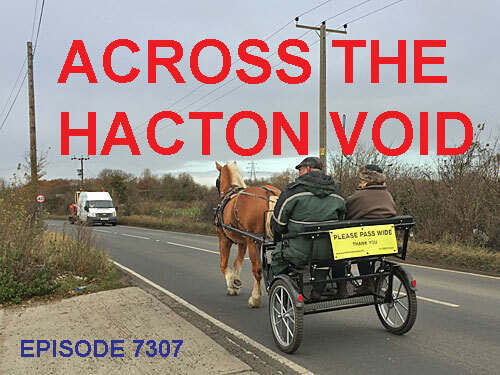 The city council decommissioned large areas of Green Belt a decade ago, reasoning that well-connected land close to the railway and the M11 would be no great agricultural loss. From Byron's Pool, Trumpington Meadows resembles a row of comprehensive schools across the skyline. Facing Hobson's Park is a string of three storey townhouses, behind which rise densely-crammed ultra-modern flats. South Trumpington is the new commuter frontier. First there was Addenbrooke's, the acclaimed teaching hospital which moved to this greenfield site in the 1960s. It's still the key player, even if its functional sprawl is increasingly upstaged by more remarkable architecture around the perimeter. 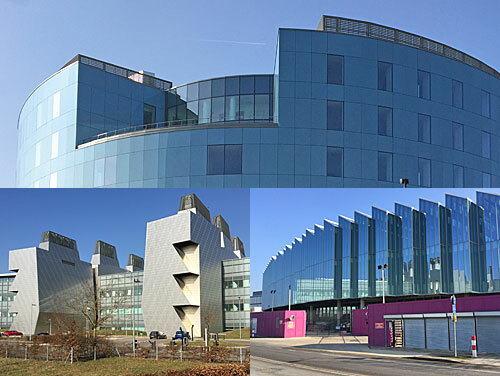 The spiky grey building with tapered roof vents is the MRC Laboratory of Molecular Biology, opened in 2013. The vast glass triangular-ish fortress, not yet complete, will be the global research and development facility for pharmaceutical company AstraZeneca. The oval tower coated in electric blue is about to become the new site for acclaimed transplantery Papworth Hospital, whose staff and patients start moving in during the week after Easter. The enormous stripy yellow cuboid is in fact a multi-storey carpark, because transport options to out-of-town sites are never 100% sustainable. And if you have your own biochemical research facility in need of a prime location and a well-qualified workforce, there's still plenty of space on campus along Dame Mary Archer Way. It's world class, is Cambridge (South). For no particularly good reason, other than hell why not, let's take an end-to-end journey on a London bus. I've selected a long-standing trunk route that's barely changed in 80 years (apart from being shortened at one end and diverted past the bus garage, before all the MWLB leap in and tell me how wrong I am). It also cuts across the heart of Metroland, an area more normally defined by its train connections, which might provide some intriguing contrasts. It's the 183, which runs roughly due west from Golders Green to Pinner through the boroughs of Barnet, Brent and Harrow. Set your watch for Sunday lunchtime and join me on the upper deck. 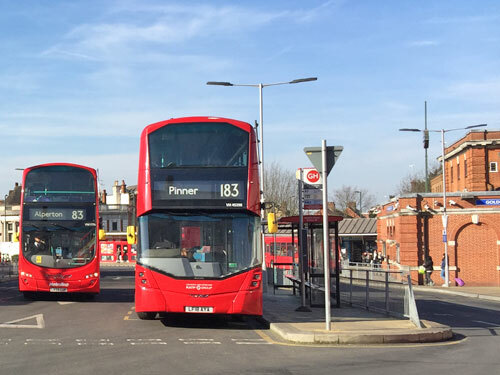 Golders Green station is the launching point for a dozen bus routes, including the century-apart pairing of 83 and 183. One goes to Alperton and one to Pinner, and for much of the way they share the same roads, so early passengers hop aboard whichever flings wide its doors first. Our 183 driver has finished his fag so flings first, and waits for the lady with the nice brooch and her husband with the walking stick to board before pulling away. They have only a short distance to go, whereas I and the driver (and I suspect nobody else) are going the whole way. Golders Green can be busier on Sundays than on Saturdays, the day of rest being different around here. Just beyond the War Memorial three well known coffee chains co-exist almost as neighbours, their outdoor seating filled with froth-sippers and pastry-forkers. An oncoming delivery driver on a moped suddenly cuts diagonally across the traffic to pull in ahead of us, his reckless manoeuvre conveniently captured by the tiny camera mounted on his helmet. We pass shops called Kosher Kingdom and Torah Treasures, and a demolition site with all its signs in Hebrew, but also a Nigerian restaurant called Tummy Kom4fort because this is no monocultural zone. The number 83 bus ahead of us has been swallowing up most of the waiting passengers, so we're catching up. Two girls yet to reach their mid-teens arrive on the upper deck and within ten seconds have uttered the F word three times. They settle into a back seat, turn up something they call music and start slagging off "that Tamara". Someone else is either smoking hash or, more likely, has been smoking a heck of a lot of it before boarding. At the North Circular we wait patiently, then make a break across the dual carriageway into outer suburbia. Once upon a time the 183 turned left and the 83 took the longer diversion via Hendon Town centre, but in 1978 they swapped over (nothing to do with helping passengers, but because Hendon bus garage was on one route and not the other). That means we get to climb the no-longer-especially-high high street, past kosher delis and bagel-based cafes, and a grassy sliver of traffic island already brimming with dandelions. Boarded-up windows confirm that the Retrobloke record shop on Church Road has very much closed, its business now solely online. The bus stop outside Middlesex Uni is quite busy. Hendon Town Hall is brightened by beds of winter pansies. Across Watford Way we hit our first stretch of typically Tudorbethan semis, and they won't be the last. An old lady with a walking stick steps defiantly off the pavement without once looking at our oncoming bus as she slowly crosses, safe in the knowledge that nobody would dare knock her down. The 83 is back with us now, for a couple of miles, as we get our first glimpse of Wembley's arch in the distance. It's time to cross six lanes of the M1, followed immediately by six railway tracks at Hendon station, before a short jaunt up Watling Street. Almost all of the council blocks on the West Hendon estate have now been replaced by something shinier but less affordable, although Ramsey Close hasn't yet been completely devoured and stands out like a postwar sore thumb. The main road acts as a magnet for large low-rise commercial premises and their associated car parks, Sainsbury's being much more extensive than Pets at Home's. We bear off before the highrise horrors of Colindale to climb to the heady heights of Kingsbury. Silver Jubilee Park takes one of the prime spots on the brow of the hill, the other going to the intricate meringue confection of the Shree Swaminarayan Mandir, its glistening minarets visible to all. Queues are waiting to board at Pipers Green, opposite the shisha lounge. Roe Green Park is weekend-busy, with users gravitating to the tennis courts, multigym equipment and ping pong tables, seemingly lacking the imagination to use the grassy spaces inbetween. Blimey, the centre of Kingsbury is properly heaving. Hundreds have come to do their Sunday shopping, the most popular stores being Aldi and Kingsbury Fruit and Veg - an enormous multi-ethnic greengrocery. One family are departing with several bagsworth, plus an entire wooden tray brimming with tomatoes. Most prefer to arrive by car, or would do were not both sides of the road ripped up and barriered off for major footway works. Kingsbury is the first tube station we've passed since setting off half an hour ago. The 183 is the only bus along Kenton Road, a broad suburban artery with house numbers nudging into the 700s. At the first stop a large family group careers down the pavement hoping to board, with youngest daughter first and mother a long way behind. She sweeps up her bulging sari and lumbers towards us, unaware that passengers have just heard the "this bus will wait here for a short time to even out the service" message and so her exertion is unnecessary. The next bus is fifteen minutes behind us whereas it ought to be ten... and from this point on our driver is in no hurry whatsoever. Gooseacre Parade was built in 1930, according to the numbers chiselled into its facade, so will not originally have contained Eastern European supermarkets, vegetarian restaurants and henna stylists. What was the local pub now serves contemporary Indian cuisine. One of the semi-detached homes further along is now a temple, a couple of others (unsurprisingly) are dentists and another deals in eggless cakes. Immigrant communities hereabouts, it seems, have inspired a local economy fizzing with diverse possibilities. Our driver, meanwhile, has started stopping at bus stops nobody's requested in the hope that nobody notices. Next it's Kenton station, followed by a hole in the road bookended by temporary traffic lights, and not even this delay successfully drags us back on schedule. Before long we're rounding the Northwick Park roundabout and entering the centre of Harrow via a backstreet lined by drab flats. The 183's task is to follow the main shopping streets, where suddenly national retail chains appear with barely a nod to the broad ethnic mix we've just driven through. Harrow's still got a Debenhams and an M&S and all the main banks, and not surprisingly this is where most of our passengers alight. The driver waits another 30 seconds after they've gone. By the time we reach the bus station our top deck complement is down from almost full to just two. And here I spot a bus inspector stood by the kerb making notes on his clipboard as we edge by. Our driver has arrived miraculously bang on his scheduled time, which means no reprimands, no targets missed and no doubt several brownie points. And there are still another couple of miles to go, this the less travelled end of the route, shadowing the Metropolitan line for a couple of stations. One ugly ring road roundabout negotiated, we head up the less than bustling Pinner Road. The semi-detacheds are back. A small boy in a Superman hoodie stops to wave as we go by. It's not our turn to pause outside Harrow bus garage so that the drivers can change over. Instead we plough on towards North Harrow, as the old roadsign says, with its slightly more traditional parade of shops. The brick clocktower at Wealdstone Motors is a Metro-land icon, even if it's now always noon because the hands no longer move. An unparking car blocks the road by tackling a U-turn on departure, causing a gammon-faced man to curse and drive up onto the pavement rather than wait a few seconds. The green roof tiles of Pinner Court, beside the 1930s fire station, never fail to delight. And what do you know, our driver has recently rediscovered the accelerator and is careering towards the terminus at an impressive pace. With the inspector's checkpoint behind him, every extra minute saved will be a cigarette bonus at the end of the route. One final set of temporary traffic lights outside Pinner Library spoils his game, and then we're ducking under the railway bridge to pull up at the stand outside Santander. Every London bus journey is an adventure of one kind or another. And while I was in Pinner, obviously I dropped in at the Heath Robinson Museum. It may not be huge but it is perfectly formed, and attractively located overlooking the pond in Pinner Park. My Art Pass got me in for nothing to enjoy the permanent gallery plus the latest exhibition based on his witty illustrations of domestic inventions. 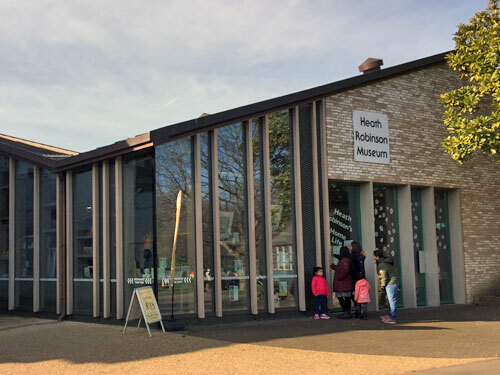 Heath Robinson's Home Life ends today, switching to an Art Nouveau themed display from next weekend, and welcoming Tim Lewis's amazing automata in May. Open Thursday to Sunday, this little gem should be on your to-visit list... and there's no need to arrive by bus. 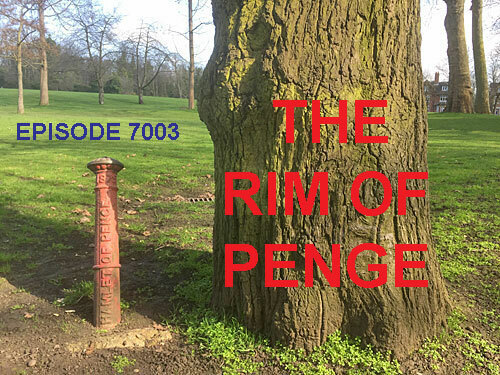 In today's episode of diamond geezer we'll be visiting a Bronze Age barrow in the heart of southeast London, discovering more about its fascinating history and asking what the future holds for this extraordinary suburban survivor. "Round barrows are funerary monuments dating from the Late Neolithic period to the Late Bronze Age, with most examples belonging to the period 2400-1500 BC." "The barrow takes its name from Shrewsbury House, to the east, built in 1789 for the Earl of Shrewsbury, a descendant of Bess of Hardwick." Stay with us for Shrewsbury Tumulus. Today we're in the heart of the London borough of Greenwich on the northern flanks of Shooters Hill. At the junction of Plum Lane and Brinklow Crescent is a small circular area behind iron railings, within which is a large grassy mound of earth. But what is it, what could it have been used for and how is it connected to both the Bronze Age and an 18th century Earl? This unassuming earthen mound in the heart of southeast London has been here on this exact site for around four thousand years. It's one of a set of six funerary monuments otherwise known as round barrows, although not all of the six survive. Round barrows are funerary monuments dating from the Late Neolithic period to the Late Bronze Age, with most examples belonging to the period 2400-1500 BC. This barrow is understood to be the last surviving example from a group of six. It stands on the high ground of Shooters Hill, and is approximately 25m wide and 1.5m high. Running across the front is a lane called Plum Lane, and immediately behind are the houses of Brinklow Crescent. Shrewsbury Tumulus lies on the precise site where numbers 96 and 98 Brinklow Crescent ought to have been built, and yet they never were. Later we'll investigate why the builders changed their minds, and how the barrow gained its name. If you've been enjoying this story, why not subscribe to diamond geezer and learn more about the secret history of the inner suburbs? Earlier we discovered a round barrow in the heart of southeast London. But is there more to this story than meets the eye? Barrows are often grouped together forming cemeteries, and the barrow at Shooters Hill is the last surviving of a group of six. Three of these are known to have formed a linear group. The location of these prehistoric burials is on a small plateau of gravel within an area of London Clay, on high ground that meant the burial mounds would have been visible on the sky-line from the lower ground towards the River Thames. 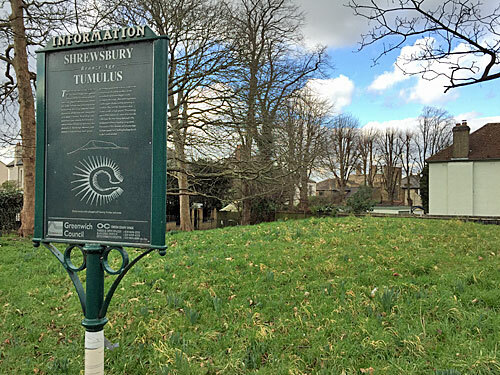 It is no longer possible to see Shrewsbury Tumulus from the Thames because of houses. The barrow takes its name from Shrewsbury House, to the east, built in 1789 for the Earl of Shrewsbury, a descendant of Bess of Hardwick. It was demolished prior to 1935 to make way for the large Laing and Shrewsbury Park housing estates slightly further up the hill. Four of the other six barrows are believed to have been built upon during this period, the precise location of the last being unknown. The surviving barrow was not in the grounds of Shrewsbury House but in the garden of Tower House across the lane. Tower House was also demolished and yet this barrow was not, which is why it survived. Three of the lost barrows were located to the north and west of Ashridge Crescent. Even though Ashridge Crescent is now part of the Shrewsbury Park Conservation Area, the barrows were not conserved. Planning rules were not so strict in the 1930s. Stay with us to discover whether Shrewsbury Tumulus still has secrets left to reveal. To learn more about the secret history of the inner suburbs, subscribe to diamond geezer for more stories you may enjoy. 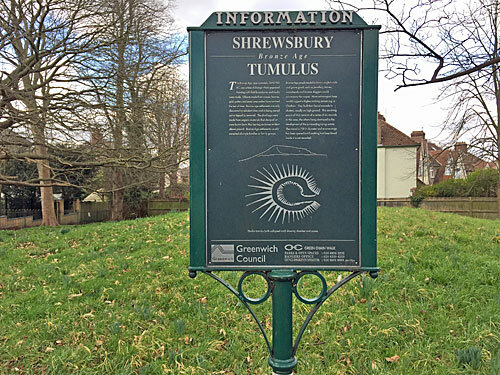 We're exploring Shrewsbury Tumulus, a burial mound in the heart of southeast London. But what exactly was it? The barrow known as Shrewsbury Tumulus stood within the grounds of the Tower House, a 19th century residence which no longer stands. Maps from the time show it illustrated with a ring of trees, only some of which remain. The surrounding area is now heavily built up, and Tower House itself is long gone, and yet the burial mound survives. But what was it exactly? At this time of year the earthen mound is mostly grass, plus a few leaves left over from autumn scattered on top. But look carefully and you'll see that if you come back next month there will be a host of daffodils here. These flowers are not original but have been planted since, so do not reveal any further revelations about the secrets of the burial mound. So what was it exactly? Greenwich Council have placed an interpretation panel at the site which notes that the barrow has at some stage been partially excavated, but this activity was not documented. Unless a further excavation is undertaken, which seems unlikely, we are no closer to knowing the secrets of this extraordinary suburban survivor. 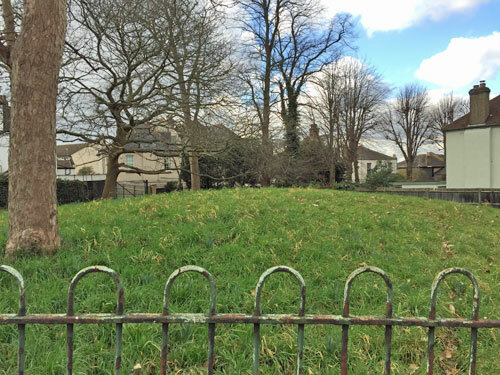 The Shrewsbury Tumulus remains a mystery with a fascinating history in the heart of southeast London. Next time on diamond geezer we'll be asking what links Tummy Kom4ort, the Tudorbethan avenues of Metroland and a clock whose hands are stuck at noon. Join us tomorrow for more extraordinary suburban secrets. If you've enjoyed this tale of secret suburbia, click now to subscribe to diamond geezer for more amazing suburban secrets. Twice a month the Sun and Moon and Earth line up - that's called syzygy. You know it's happened because we see a full moon or a new moon in the sky, depending. The alignment of gravitational pull creates a greater bulge in the world's oceans, so high tides are higher than they usually are - they're called spring tides. Periodically the Moon is at the closest point within its orbit - that's called perigee - and high tides then rise slightly higher still. These perigean spring tides, as they're called, occur around the time of so-called supermoons, and we've just had one of those. Which is why yesterday afternoon the Moon caused minor flooding along the Thames and its tidal tributaries, thanks to supermoontides - as absolutely nobody yet calls them. Richmond's waterfront often gets hit, and Twickenham, and Putney Embankment, and the walkway alongside the Pool of London by Old Billingsgate Market. 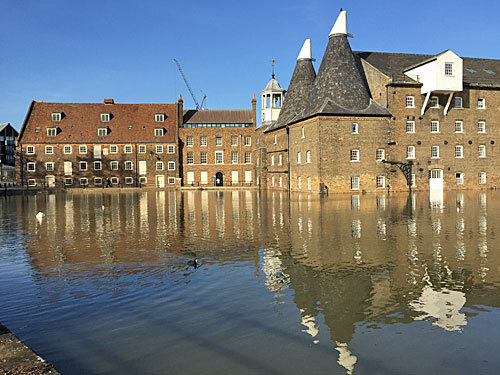 But another place mentioned in yesterday's flood warning was Three Mills Island, and that's near me, so I went along to observe the rising water. Three Mills marks the upper tidal limit on the River Lea, blocked upstream by Bow Locks, the tide mill itself and the barely-used Olympic lock on the Prescot Channel. Twice a day at high tide the pool outside the House Mill fills up, but at supermoontide it almost overflows. The water level stops rising three bricks below the Clock Mill's windows (and if you come back quarter of an hour later it's down to four, as a freshly wet line around the water's edge attests). 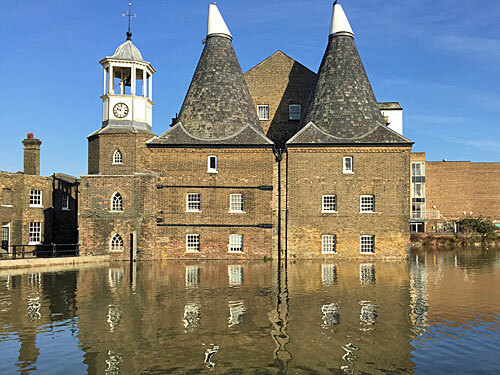 Although all looks contained, the waterwheels of the Clock Mill are now fully submerged, which causes the river to spill out underneath the building and gurgle through a drain into the yard. 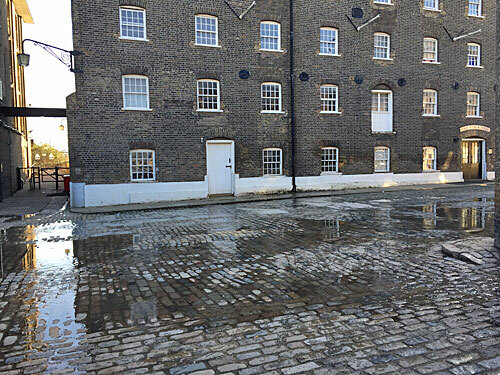 The cobbles outside the entrance to Three Mills Studios become wet with puddles - nothing unduly serious but enough to make employees popping over to Tesco look slightly surprised, and tread carefully. A thin strip of land wends south from Three Mills carrying the footpath which one day will be otherwise known as the Leaway. 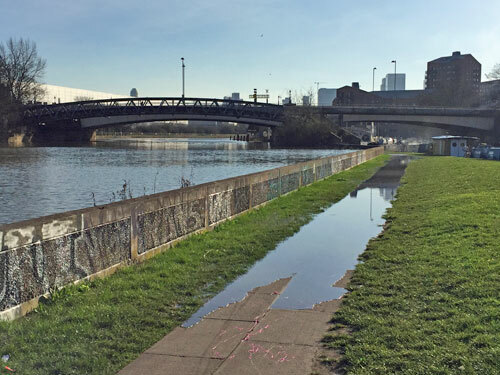 To one side are the tidal waters of Bow Creek and on the other side the tamed channel of the Lea Navigation (leading down to the Limehouse Cut). 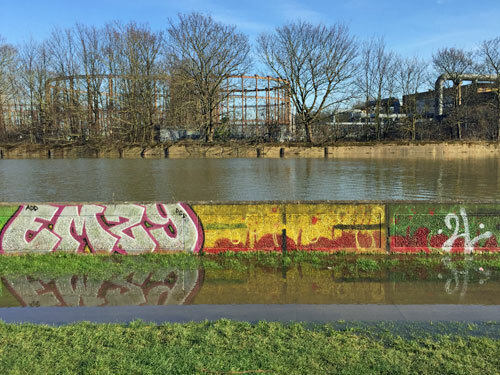 The water level in the Lea Navigation remains constant, but Bow Creek has a considerable vertical range which means, just occasionally, its water almost doesn't fit. South of the District line Bow Creek is held back behind a low concrete wall, usually irrelevant but at supermoontide breachable. 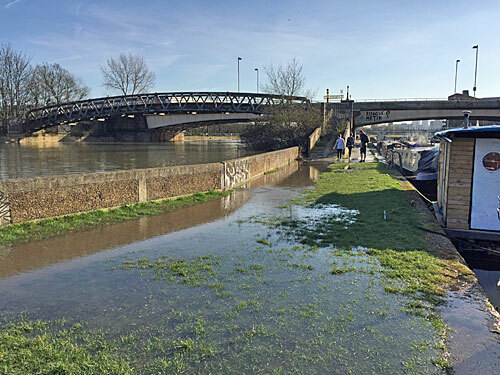 River water trickles through gaps between the blocks, particularly at a single point just before Twelvetrees Bridge, oozing through onto the path and adjacent grass. As high tide approaches you can watch the water's edge encroach gradually along the footpath until it's submerged to a point where only someone in decent boots would risk using it. Numerous pedestrians and cyclists arrive not expecting anything to be amiss, because it usually isn't. Some stare at the squidgy grass and turn back, while others make for the stones along the edge of the navigation and tread carefully along, taking care not to slip on the water flowing from one side to the other. A lady with a pushchair decided against. Two joggers splashed through. Three police officers strode nonchalantly on. The lady from the nearest narrowboat popped out to take photos. A large group of young half-term cyclists stopped and waited while their significant adult tried to work out an alternative route. Within an hour everything on the banks will be back to normal, and within six hours the supermoontide will have completely drained away. 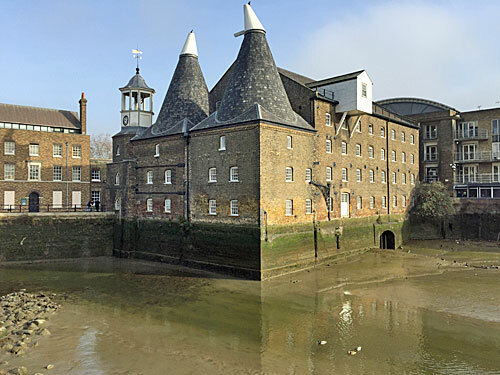 For every extra-high high tide there's an extra-low low tide, when even more of the muddy bed of Bow Creek will be visible than usual. Today expect that bottom-scraping low around 10am, and another spring tide overtopping just before four in the afternoon. Supermoontide will return in a month's time, around 22rd March, and then again in the autumn around 1st October. You could go and watch the Severn Bore instead, if spectacle's your thing, but the Moon puts on a show of minor overtopping a lot closer to home. I love Citymapper, I mean who doesn't, given that TfL can't be bothered to make their own travel app because the private sector made a better one. I've been saying nice things about Citymapper since 2011, and about the app since 2013, and basically it seems impossible they still offer it for free. But now there's a new thing that Citymapper will be doing, and that's act like a sort of contactless Oyster card, and basically I don't need it so I don't understand why anyone would need it so I don't know why they bothered. I loved Citymapper more back in the days when the app loaded before the next bus arrived. It's got very bloated of late, packed with additional functionality I don't need, whereas it used to pop up quickly and tell me when the next 108 was coming. Admittedly some of this extra stuff has proved useful when I was travelling around Birmingham, Paris and Berlin, but the app also includes modes of travel I don't use in cities I have no plans on visiting, and basically I don't need it so I don't understand why anyone would need it so I don't know why they bothered. Citymapper even started doing taxis last year only they didn't call them taxis they called it Smart Ride. It's basically Uber, but within a somewhat narrower area, and they have drivers in black Merc minibuses circling on specific routes so essentially not really Uber at all but similar. Obviously at £5 a time I'm not interested, because that's more than three times what a bus costs and I'm not ashamed to slum it with the plebs. You wouldn't see me dead in a taxi and basically I don't need them so I don't understand why anyone would need them so I don't know why they bothered. The new feature is called Citymapper Pass and it launches next month. Essentially it's a like a contactless card because it is actually a contactless card except it's green. You can't get hold of one yet because it hasn't launched yet, but a limited number of green cards will be available to users of the app like what I am, except I don't want one because basically I don't need it so I don't understand why anyone would need it so I don't know why they bothered. The idea is that, instead of using your Oyster or bankcard or mobile smartapp like you would normally, you use the green Citymapper Pass card instead. Everyone has an Oyster or bankcard or mobile smartapp so it's not like they need another piece of plastic, but Citymapper hope you'll want another piece of plastic because of the extra things it'll do and how much it'll cost, however hard it turns out to be to actually get hold of one of them. Not that I care because basically I don't need one so I don't understand why anyone would need one so I don't know why they bothered. Your Citymapper Pass is a subscription card, so you pay a set amount and can then pick from a smorgasbord of travel options and use them as much as you like over the course of a week. In this respect it's more like a Travelcard than Pay As You Go, which is odd given how much TfL have gone on and on and on and on about contactless capping being better than Travelcards. I already have a Travelcard so I wouldn't use a Citymapper Pass enough to make it worthwhile so basically I don't need one so I don't understand why anyone would need one so I don't know why they bothered. They haven't announced how much a subscription will cost except they vaguely have. According to websites which aren't Citymapper there will be two types of subscription. The cheapest will cost £31 and will be the equivalent of a Zone1/2 travelcard. That means you can use any tube or rail service in inner London, except the ones you can't, plus any bus presumably anywhere. As I have already mentioned I already have a Travelcard, and it's annual, so basically I don't need anything else so I don't understand why anyone would so I don't know why they bothered. What's intriguing is that a Zone1/2 Travelcard caps out at a maximum of £35.10 per week whereas Citymapper are offering exactly the same thing for £31 which is about four quid less. TfL are still going to get the full amount because Citymapper have agreed to pay the difference, which is either an extraordinary act of mass generosity or an evil landgrab to trap as many commuters as possible within their financial web before removing the subsidy. It sounds like a conspiracy theory to me, but it doesn't matter because I don't need one so I don't understand why anyone would need one so I don't know why they bothered. Even at £31 a week that's expensive. A Zone1/2 Travelcard costs £1404 a year, whereas fifty-two weeks of a Citymapper Pass would cost £1612 which is £208 extra which is basically four quid a week. You could get an annual Zone1/3 Travelcard for that. Citymapper are keen to let you know you can pause your subscription as and when, and nobody spends every week of the year in London anyway, but if you have the money you should definitely buy an annual Travelcard instead like what I have, and basically I don't need anything else so I don't understand why anyone would so I don't know why they bothered. What's more if you go outside Zones 1 and 2 you'll have to pay the normal extension fares, just like you had a Zone1/2 travelcard anyway. Most Londoners live outside those zones, so they'd be better off getting the appropriate Travelcard instead, and not even Citymapper's generous £4-a-week subsidy will save them money. I haven't actually worked that out, I've just assumed it, but basically I'm not interested because I don't need it so I don't understand why anyone would need it so I don't know why they bothered. The second Citymapper subscription option, the Super Duper Pass, will cost £39. For this you'll get exactly the same as the £31 option plus unlimited use of the TfL bike share scheme plus two free rides on Citymapper's Smart Ride system. The extra £8 is worth five days of Santandering or it's worth two trips in a smartbus, so you need to be either a confirmed cyclist or cab-user for this to be worthwhile. I'm neither, and obviously unwilling to engage with either, but basically I don't need it so I don't understand why anyone would need it so I don't know why they bothered. There are obviously plans to extend all this beyond zones 1 and 2 eventually, but not yet because this is only the beginning. Also Citymapper are keen to get other bikeshare systems on board, like those chunky lime green bicycles you sometimes see dumped on roadside verges, plus future transit systems like electric scooters or presumably personalised jetpacks. My rigid mindset means I won't ever need any of those so I don't understand why anyone would need them so I don't know why they bothered. Citymapper must have embarrassingly deep pockets because the app's been free for several years and they run their black cab Smart Rides at a loss. Now it seems they're willing to throw away a fiver a week on everyone who signs up to their new Pass, which'll eventually add up to a tidy sum, so we should be asking what's in it for them? Essentially they want your undivided attention, and to be the conduit for your future transport costs in London and all other major cities. Plus of course they hope you'll end taking lots of extra Smart Rides at a fiver a time which I would never do because basically I wouldn't do that so I don't understand why anyone would so I don't know why they bothered. Our entire economic future is basically subscription-based as private companies try to get us to dripfeed them money on a regular basis for services we'd once have paid for as one-offs. Spotify does it, Amazon does it, Netflix does it, your local gym does it, and now Citymapper is trying to do it by placing themselves at the heart of your daily travel payment routine. The prize is big for whoever takes long-term control, so it's worth them investing money at the start for massive rewards later. The rest of us can just carry on using the free parts of the app for free, because they were just the entry-level sweetener, and basically I'm not going to fall for it so I don't understand why anyone else would fall for it so I don't know why they bothered. The City of London isn't blessed with a great deal of public open space, because commercial buildings have always taken precedence over parks and gardens. So it's reassuring that its planning department has been encouraging the developers of new buildings to provide open space at roof level and, crucially, to allow free public access. 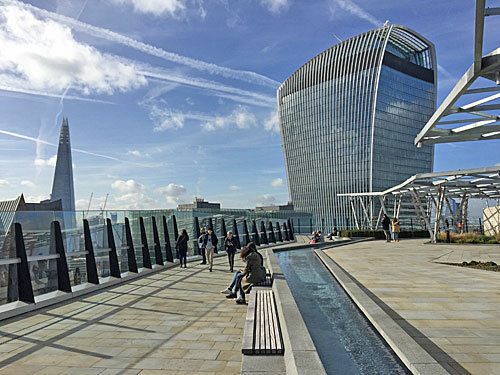 The latest such elevated playground opened last week fifteen storeys above Fenchurch Street, and is surprisingly large, and you can just walk in. They call it The Garden at 120. 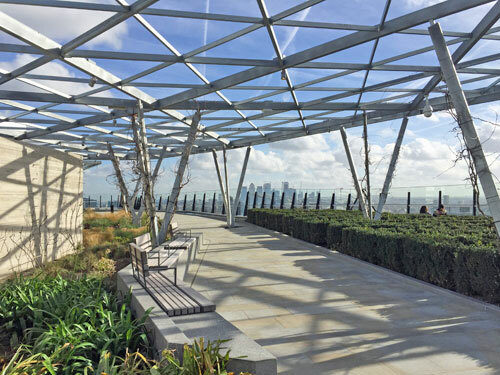 Head to the new highrise quarter south of Leadenhall Street, a modern maze of office receptions, lunch options and minimal sunlight. Hunt for the alley through the big splayed building, a passageway with a giant video screen on its roof. Importantly don't just walk over to the lift, because staff will give you such a look, but aim for the door into visitor reception where security are waiting. I was expecting a belts-off keys-out check, the detector arch being poised and ready, but refreshingly I was simply waved through and sent back to the now-smiling lift sentries. You press the buttons yourself. It's a swift ascent. I didn't go wow on stepping out but someone else did, more for the scale of the space than its altitude. You emerge into the centre of an approximate quadrilateral, with steps leading down into the building and walkways to the perimeter. Much of the space consists of raised beds and pergolas, not yet entwined with the abundant wisteria shown in the architects' drawings. Several wooden benches are provided, along with further seating alongside a zigzag water feature. Screens seal off a couple of compounds which contain all the machinery a modern building needs on its roof, including a cage for the window cleaners. The promised coffee cart has not yet appeared. The place to be is the walkway around the edge, safely protected from the drop by a slanting glass screen. This is great because it allows an uninterrupted 360° view, but less great because it disrupts any photograph you might attempt to take. Mucky glass isn't yet a problem here, but reflections definitely are on a sunny day, echoing the frustration of anyone who's taken a big lens up the Shard. Of course this visual interference doesn't stop everybody trying, or stepping back a bit for that all-important landscape selfie, or wandering around giving a running commentary into a camera for the benefit of audiences elsewhere. Far better to put your phone down and simply look out, and/or look down, and to feel a proper part of the surrounding cityscape. The view from any high building in the City is dependent on its location, specifically how many taller buildings exist close by. 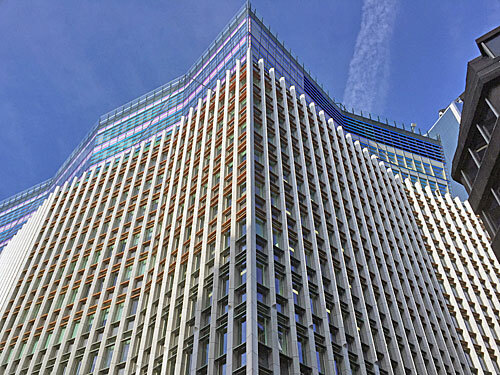 In this case the view to the north is almost entirely blocked by adjacent towers, one the HQ of Willis Towers Watson on Lime Street, the other the so-called Scalpel. The latter has sensibly opaque windows, but the interior of the Willis Building is clearly on view, including crisps and apples piled up in the canteen and the office of a suited executive with the misfortune to be located on the 15th floor. 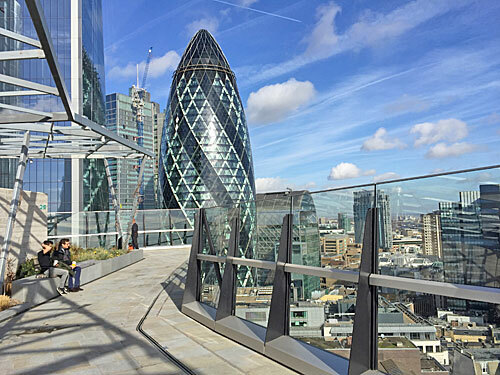 The Cheesegrater slips through a gap between the two, and a refreshingly-clear view of the Gherkin completes the northern wall. The other quite-close tall building is the Walkie Talkie, the Fenchurch Street neighbour that once fried pavements, and the first City building to bring the skygarden concept to life. Its location leaves a fair swathe of west central London on view, stretching from a turret of the Palace of Westminster and half the London Eye, panning past the Thames at Waterloo Bridge, across the dome of St Paul's (if you stand in the right place) to the lowlier skyline around the Post Office Tower. It's good, but it's not outstanding. 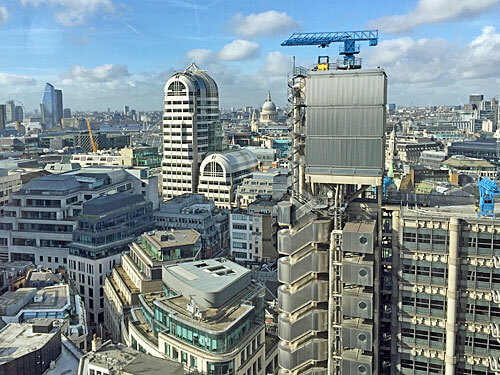 What you do get however is a proper close up of the Lloyds Building and its exterior pipes and metalwork, so that's a bonus (plus all the dishes and ventilation units on the roofs of mundane office blocks nobody's yet got round to redeveloping). The view to the south would be brilliant were it not for the dodgy neo-gothic 1990s postmodernism of Minster Court slap bang in the middle. It is possible to spot City Hall and Tower Bridge to one side, and nothing hides the Shard, but being a couple of storeys higher would have made all the difference. On a clear day the best thing is the uninterrupted panorama across south London from Shooters Hill to the TV mast at Crystal Palace, then the row of hills beyond, and faintly the row of hills beyond that. East London, by contrast, is already disappearing behind various mundane towers, but Docklands stands proud in the background, and the Olympic Stadium can be seen poking out behind a dull block near Aldgate. These days any lofty vantage point is an excuse for a bar or restaurant, and in this case D&D have taken over the floor immediately below. Their tables won't be opening until later in the Spring, at which point the garden will gain a more commercial feel, but you can already nip down and use the loos. In the meantime a lot of office workers are already using the upper floor as somewhere to bring their lunch, shovelling noodles with colleagues, just as if this were a proper park in the sky. In an age of increasingly private cityscape it's wonderfully reassuring to gain a new public space as yet devoid of miserably excessive regulation. The one thing to watch out for is capacity, because the The Garden at 120 has a oddly-specific maximum permitted limit of 207 persons. Midweek in week one all was fine, but weekend opening could mean queues negating much of the joy of a turn-up-and-go attraction. The building's website has a Live Footfall Counter to help warn if your journey might be wasted, but be aware it doesn't always work (it was showing 0% while I was up there with a few dozen others). Access is daily from 10am, with weekend opening currently subject to a six week trial. Best come soon before it becomes too fixed a part of the tourist trail (queues for the nearby four year-old Skygarden are atrocious). 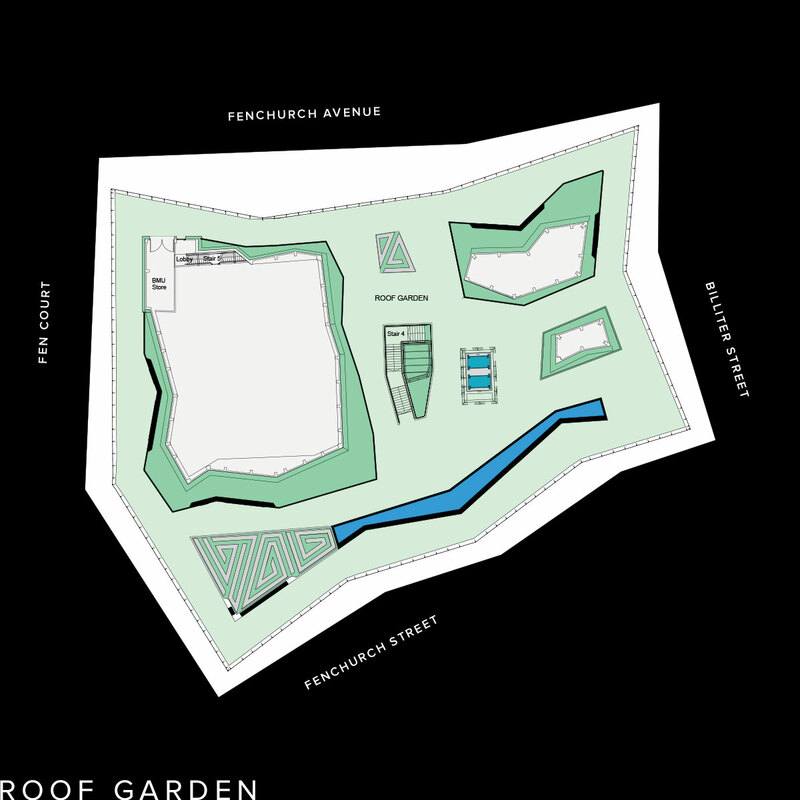 But hurrah for a City project that's much better than it ought to be, and hopefully heralds a future chain of miniature public parks in the sky. Are there too many announcements at tube stations? It helps to know where the next train is going, and when, but how much additional noise is there? Answering that question is best done with concrete data, so I've been to my local station - Bow Road - to listen carefully to what the disembodied voices on the westbound platform have to say. Normally I spend a few minutes here so only hear a random snapshot of the overall set of messages. But it turns out there's a definite underlying pattern to what's announced when, and I think I've worked out what's going on. Firstly, service status. These are the messages that tell you where the severe delays are, what's suspended due to engineering works or whether there's a good service on all lines. At Bow Road this key information is delivered every five minutes. If you're on the platform at three minutes past the hour you'll hear it, then at eight minutes, then thirteen minutes - a total of twelve times every hour. This high frequency means a passenger is quite likely to hear the information while waiting on the platform, but might not, and almost certainly won't hear it twice. Secondly, safety. These are the messages that urge you to behave appropriately as you move around the station. They vary according to who's decided to record precisely what, but on a particular day you'd expect to always hear the same one. The current message at Bow Road urges passengers to "prevent injuries" by taking "extra care", and "please use the handrail if you need to". It plays out at four minutes past the hour, then every ten minutes after that. You probably won't hear it on a single visit, but over the course of a commuting week you almost certainly will. Thirdly, security. This is the dreaded See it Say It Sorted message, along with a reminder that CCTV is in operation and an exhortation not to leave belongings unattended. At Bow Road it plays out on the hour and every fifteen minutes after that. That's just four times an hour, which may be less often than you thought it was... at this station at least. As far as I can tell Bow Road has just three different announcements at present, and a clockface system of delivery. One announcement plays at times ending in 3 or 8, another at times ending in 4, and another at multiples of 15. That way they never overlap. It also means there are sometimes four minute gaps with no messages at all, and at other times three messages in three minutes. Whatever, I don't think you could describe this as unduly excessive. One drawback with rigid clockface delivery is that messages sometimes play while a train is entering or leaving the station, so cannot be heard. During the period I was stood waiting only half of the messages were clearly audible, a quarter were partly obscured by noise and a quarter were pretty much drowned out in their entirety. The acoustics at Bow Road's below-ground platforms don't help, but those aren't great odds if staff want a key message to be heard and acted upon. But are announcements at other stations similarly organised? To help find out I've been to three other stations and stood around on one platform listening for half an hour. Because these aren't my local stations I have no idea if these half hours were adequately representative. Also I visited on a day when it was raining and there were engineering works elsewhere, and this will have affected what I heard. So although what follows isn't necessarily what always happens, I can confirm that none of these stations exhibited the regular simplicity of Bow Road. This was messier. The service status message was quieter than all the others, so more easily drowned out, and didn't play at precisely rigid five minute intervals. It also said there was a good service on all lines (which wasn't what other stations had been saying about the same situation). The safety message played every ten minutes, exactly as at Bow Road (except here the content was escalator-focused). The See It Say It Sorted message only cropped up once in half an hour (which was odd at a station that's far more of a security risk than Bow Road). And here there was an extra message every fifteen minutes about the joys of contactless payment, which I didn't hear anywhere else. This was messier still. If you'd been waiting to hear which lines were disrupted you might have been waiting 20 minutes or you might have been waiting five (I wondered whether this information would normally play at regular intervals but the "train now approaching" message took precedence). The message about taking care and holding the handrail was played roughly every five minutes, which is twice as often as at the previous two stations and verging on the nannying. The See It Say It Sorted message never cropped up at all, which some of you might be pleased to hear, but why is there no consistency here? The platform announcements at this station were also the only ones to mention the wet weather outside, and boy did they go on about it. The wet weather message was played an astonishing 12 times in 30 minutes, often only one minute after it was last broadcast. There was also one spell where it wasn't played for seven minutes and another where it wasn't played for six, which might give you some idea how relentless the intervening periods were. What's more, the actual announcement was "Information for passengers entering <name of station>. Owing to adverse weather conditions you are advised to take extra care whilst walking through the station as all surfaces may be slippery. Thank you." Those of us standing on the platforms had already entered the station so did not need to hear this message, or else it should have been phrased differently, and basically if you want evidence that there are far too many stupid unnecessary announcements on the tube, here it is. Finally, the DLR does things very differently. Every service on the DLR runs at least every ten minutes, which means nobody should ever be standing on a platform longer than that. I wonder if this is the rationale behind playing all these announcements roughly every eleven minutes, so that nobody can ever hear them twice? Also there were two different security messages - one See It Say It Sorted and the other CCTV/belongings-related. Also there were no messages here about holding the handrail or service status on other lines, which there were everywhere else, but there was a message about the #LookUp campaign instead. Most intriguingly, all the announcements at this particular DLR station were clumped. There were none whatsoever for seven minutes, near enough, then a bunch of five messages played out over the course of the next four. You might wait around and hear no messages at all, or you might only be on the platform briefly and hear several. Which means, in conclusion, I have no conclusion. For every station like Bow Road that organises announcements rigidly there's another that does it completely differently. Certain stations or station groupings appear to have the autonomy to do things the way they want to, or to choose content to better match their local circumstances. In some cases announcements are measured and carefully spaced, but in others it seems they play almost on a whim and can indeed be annoying. Whoever launched that volley of wet weather messages on the Northern line, for example, needs audible restraint. And you might never spot the difference unless you hang around and listen.